When news spread quickly Tuesday about Russell Wilson’s monster extension with the Seattle Seahawks, quarterbacks around the NFL rejoiced. Thanks to Wilson’s new deal, which tops Aaron Rodgers’ average annual value ($35 million compared to $33.5 million) and makes the Seahawks QB the league’s highest-paid player, the valuation of quarterbacks expected to sign new deals will rise concurrently. That’s good news for those on the middle of the QB spectrum like Dak Prescott, who won’t command Wilson money but should see the average annual value of his salary rise whenever his extension with Dallas gets done. When Mahomes says he loves K.C., it’s not something he’s saying out of duty. He’s getting a new house soon in the K.C. area, and while he doesn’t go out in public as much as he once did, when he does people generally give him space. For a private individual like Mahomes — his offseason media tour notwithstanding — that matters. And yes, the money will be pretty good too as it’ll easily make him the highest-paid player in the NFL and give him and his family generational wealth. Prior to Mahomes’ arrival, a quarterback the Chiefs drafted hadn’t won a game for them in 34 years. In many ways, Mahomes’ arrivals and impending journey to superstardom was like giving a starving man an all-expenses paid trip to Nobu in Malibu. Not only is the food premium, it’s expensive. But you’re good paying for it because the meal and the experience is so delicious. To fans of the Chiefs, a franchise that had employed a stream of steady-but-unsensational quarterbacks (Alex Smith, Trent Green, Steve Bono, Steve DeBerg), the concept of the league’s brightest young star at the league’s most important position wearing red and gold is still incomprehensible. Here’s a guy making the rounds on late-night shows, setting ground-breaking endorsements and positioning himself as a foundational piece of Adidas’ football division, and the whole time, he’s representing the Chiefs and their brand. 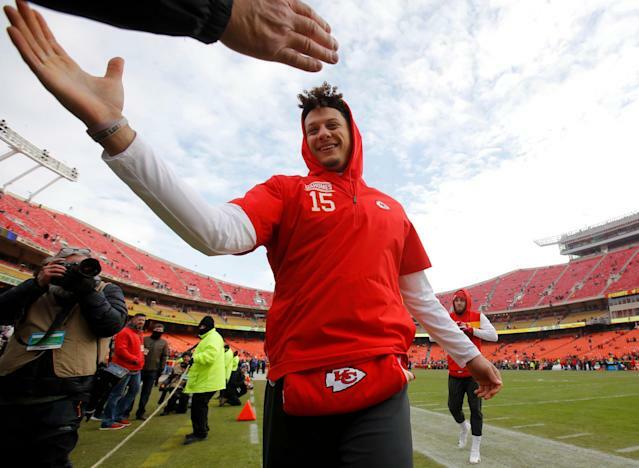 What’s more, Mahomes has a chance to be the rare football player who — in an age when fans are eschewing $100 parking, and are staying home to watch games on their ultra-clear, big-screen TVs — actually brings people to the stadium. That’s Barry Sanders stuff. Deion Sanders, too. The list of “I gotta see him in person” guys isn’t long. So yeah, if you’re the Chiefs, that’s a guy you retain, no matter what it takes. And since the price goes only up on premium players the longer a team waits to pay them — like Justin Houston in 2015 and Eric Berry in 2016 — it’s safe to assume the Chiefs, who are slated to have a whopping $58 million in salary-cap space in 2020 thanks to the recent cuts of Berry, Houston and the trade of Dee Ford, would like to get out ahead of the Mahomes payday as they are able to next January. If Mahomes, the league’s best young player at the league’s most important position, wanted to drive a hard bargain, he probably could. So it’s best to keep him happy, just so things stay harmonious. Remember when there were rumors about Rodgers (during his negotiation with Green Bay a year ago) asking for a series of player options — which would essentially give him control, thanks to the looming threat of opt outs — in addition to a deal that would tie his salary to the percentage of the cap? Rodgers didn’t get either, as they would have set historic precedents. Theoretically, Mahomes — who is only 23, compared to Rodgers at 34 — would have a sturdier leg to stand on. These are the kind of things a player probably asks for if his team decides to play hardball and/or make him wait for the big payday. Hell, if you’re Mahomes you may be asking for them anyway, just to further solidify your standing and influence on the team being constructed around you. But those are also enticements you might give up if, in lieu of paying you a base of $735,000 — Mahomes’ salary in 2020, not including a $1.9 million roster bonus — your team decides to do right by you and make you the highest-paid player in league history. The carrot of the latter, the Chiefs must hope, will be enough to prevent Mahomes from taking a hard line on the goodies, just like Rodgers eventually did. So for many reasons, the sooner the Chiefs lock up Mahomes to a history-making contract, with Wilson’s deal as a baseline, the better.